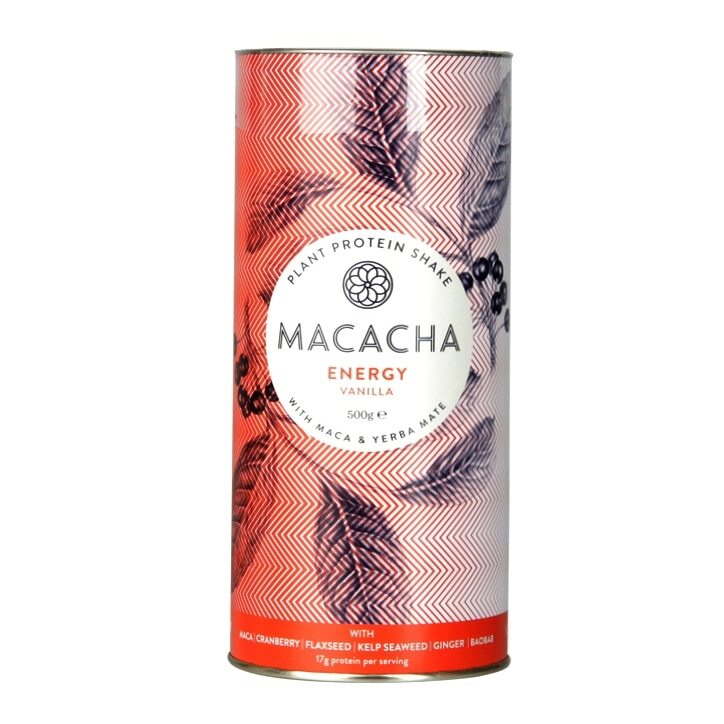 Macacha's Energy Blend is a high protein, nutrient dense, plant protein shake with botanicals, adaptogens and Yerba Mate, for active people looking to support a high-energy lifestyle. This plant-protein packed formula provides additional support to aid normal energy metabolism and thyroid function thanks to Iodine-rich kelp seaweed. Also rich in iron, this blend contributes to the metabolism that produces energy and prevents fatigue. takes your fancy and enjoy! Shake up if it settles (we don’t use gums or stabilisers!) For best results take within a hour of exercise. 1-2 sachets. Ingredients per 30g Serving: Organic Brown Rice protein 12.25g, Organic Pea Protein 11g, Organic Maca Root powder 1111mg, Organic Baobab (dried fruit pulp) powder 555mg, Organic Cranberry fruit powder 555mg, Organic Flax seed powder 555g, Organic Kelp (Ascophyllum) Seagreens powder 555mg, Organic Ginger Root powder 555mg, Yerba Mate powder 545mg, Natural Vanilla flavouring Sweetener: Steviol glycocides (extract from the Stevia plant). Food supplements should not replace a varied and balanced diet and healthy lifestyle. Keep out of reach of young children. Do not exceed the recommended daily intake. Seek professional advice during pregnancy. Macacha Energy Plant Protein Vanilla is rated 4.7 out of 5 by 19. Rated 5 out of 5 by Jadapops from Great natural protein shake I tried this protein shake for the first time last month. The natural ingredients really caught my attention and the fact it is plant based and vegan friendly. It tastes great and is very versatile, either make as a shake if in a hurry or incorporate into a breakfast smoothie bowl. Rated 5 out of 5 by Anonymous from Amazing! I love Macacha! Not only it tastes great wether you mix it just with milk or in smoothies, treats and baking but it's also much more than a protein powder. It delivers a concentrated dose of antioxidants, minerals, vitamins and phytonutrients. If you are looking for a blend to nourish both body and mind, this is it! Bonus the ingredients are really good quality! Rated 5 out of 5 by Anonymous from Great drink from natural products I tried this while I was visiting London and found it was fabulous. Great taste and not chalky like others I have tried. I love the individual packet and packaging-- very refreshing. Rated 5 out of 5 by Vegannat from my favourite by far This tastes great and it doesn't have any ingredients I can't pronounce. Its also a good balance of protein for calories. I have tried literally dozens of protein powders (bit of a picky eater) and found some truly disgusting ones, some ok ones, and then the Macacha which is tasty. I have had it as a smoothie but my favourite is mixed in with some soy yogurt and berries - yummy. The sachets are super convenient too - I just pop them in my luggage when I'm away from home and that way I don't need to worry about getting enough protein.